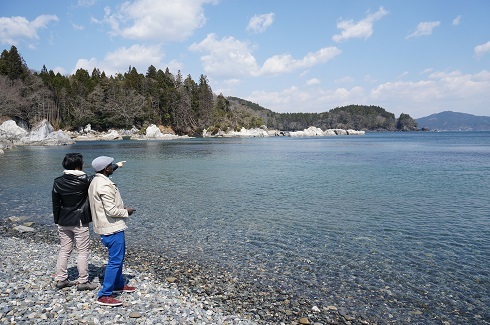 Over the weekend of April 12-13, 2014, we made the first trial tour to Sanriku area for English-speakers. 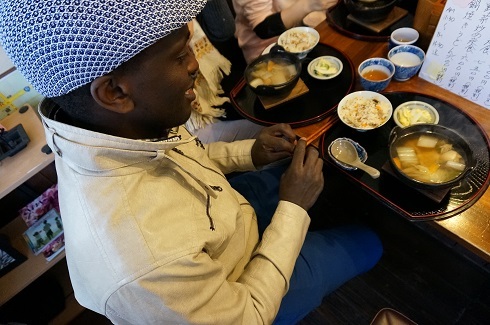 Mr.Zabron Kamau, who came from Kenya and has been studying and working in Japan over the past six years, joined the trial tour as the first participant. 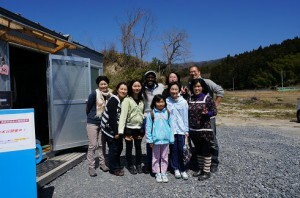 From the Let’s Talk Foundation, Hiroko Okuda (Director) and Tsuyoshi Komori (Founder, Rep Director) attended the tour. It was a great success, and now we have a confidence in our offerings. The tour started from Tokyo Station. We took 07:16 Shinkansen bullet train to north east Japan. 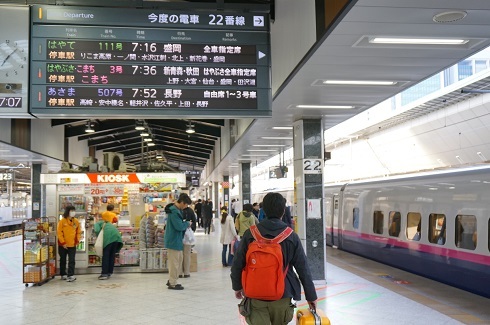 It was an enjoyable, two hours-plus trip to Ichinoseki Station…. We got off the train on 09:30. 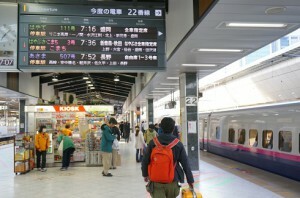 At the Ichinoseki station, we picked up a rental car and started moving to Rikuzentakata. On our way, Zabron-san checked where to go for lunch on a nice guide book named “Takatabi,” which featured many destinations in Rikuzentakata. 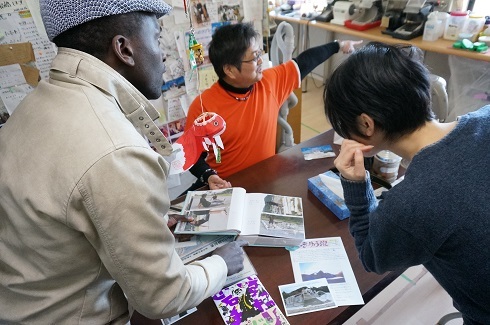 The booklet was developed by Iwate University students and is distributed for free. An incredible quality as a free guide book. 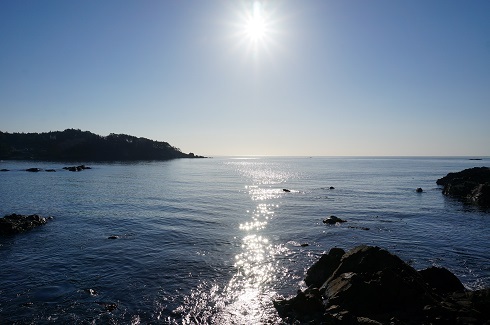 Getting closer to Rikuzentakata… We just dropped in at “Dairiseki Kaigan” (or marble stone coast) to feel the beautiful ocean. Blue sky, clear water, and quite sound of waves… A breathtaking view. 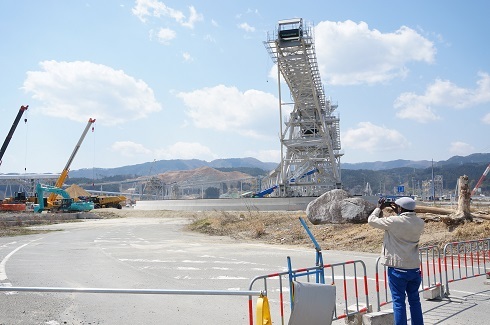 Having arrived at Rikuzentakata, we first went to see a big conveyor recently started operating along the shore of Rikuzentakata. What do you think is this? This is used to carry earth and sand from the top of the mountains to the plain fields for a land-fill. The majority of the plain in Rikuzentakata was devastated by the tsunami, and also a ground subsidence occurred. Therefore, for a reconstruction of the town, they need to fill the plain field with massive amount of earth and sand. The opinion of the local people about this gigantic machine is divided. 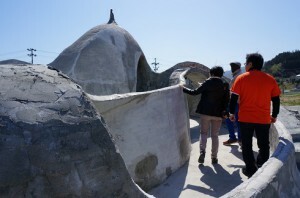 Some say this is great as it will accelerate the reconstruction, and others say the municipal government should use money for the quake victims first. Anyway, the machine has already been constructed and has started working. 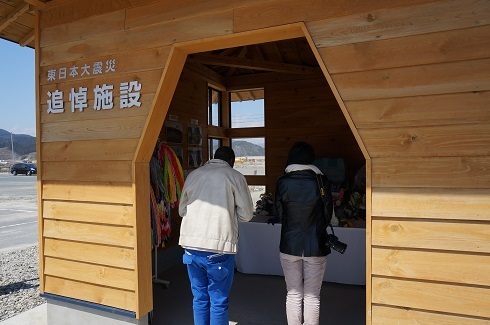 We then visited a tsunami monument site, where used to be “Michino-eki Rikuzentakata” (local products and souvenir shop with a large parking space). This site will be preserved as a part of earthquake monument park to be constructed in the near future. 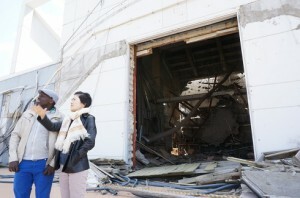 You can look inside the tsunami-stricken building and can feel what happened. 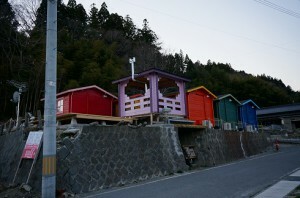 In front of the tsunami-stricken building, there is a facility for prayer to the victims of tsunami. You cannot but feel like praying here, if you are aware Rikuzentakata was one of the most severely damaged places among the whole affected areas. It has been three years already since then, but it has been only three years from that nightmare. Our memories are still new. What a big roll… It included several thick sashimi (sliced raw fish) in it. An amazing volume and great taste. After lunch, we spent some time in a cafe within the same temporary mall. 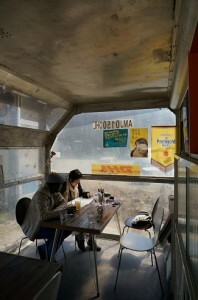 This cafe uses a huge container box of DHL as a sun room. You can enjoy a very unique atmosphere. Drinks also tasted good, by the way. We moved to Takekoma Shrine. 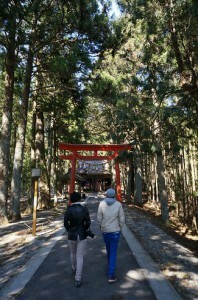 Under a clear, blue sky, cool winds passed through the forest of the shrine smoothly… This is a well-maintained shrine, and it is always refreshing to walk around here. Then we joined a kimono-wearing class. 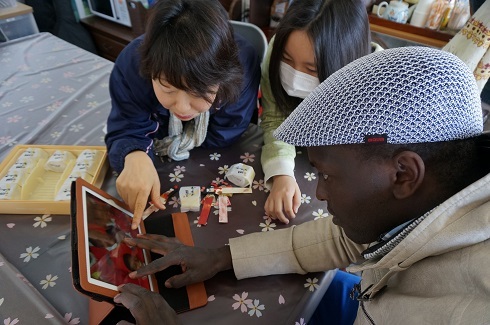 Ms.Tomoko Matsuzaka (left in the photo below), a kimono-wearing master, resumed the class after the tsunami. She has also been participating to “Komo’s English Reading-aloud Club@Rikuzentakata” almost every month, and she has been practicing English conversations tailored to kimono-wearing occasion! Ms.Kayo Oikawa (right), who is also a participant to Komo’s English club, joined the class as an assistant to Ms.Matsuzaka. It was a well-designed, interesting session, especially for Zabron-san. This was his very first experience to wear kimono… Look at his serious eyes! 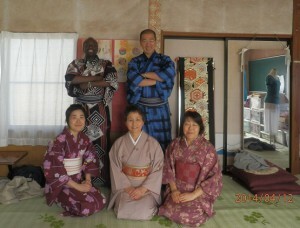 As the class prepares some kimono dresses for the visitors like this, you don’t have to bring your own kimono. You can just come in and can practice like this! 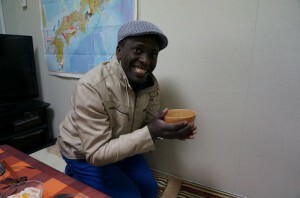 The class took approximately two hours, including greetings, lessons/practices, and conversation over a tea before closure. It was a very unique, meaningful afternoon for the tour. I do hope the future visitors to Rikuzentakata from outside Japan would try this class. 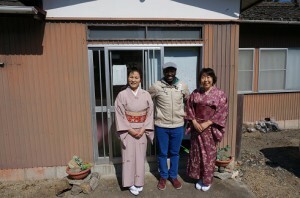 You cannot find many classes like this, where you can get the kimono-wearing lesson in English, across Japan. Sato-san demonstrated his hand-dug well to us. 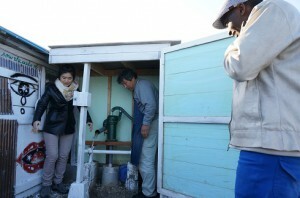 He was not an expert of digging well at all, but he needed to do so as he had to use water for his seedlings. So he used very primitive tools, like ladle and bamboo cylinder… He is a living example of traditional Japanese virture, or “bushido” (swordsmanship), to stand strong in a hardship. He a man of gut, effort, and perspiration. 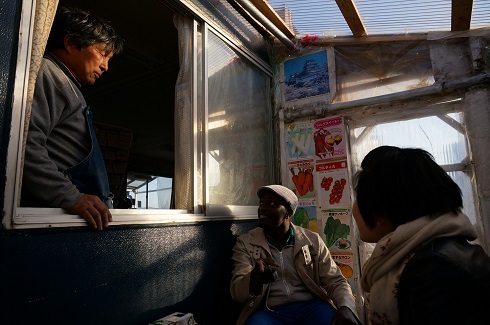 Sato-san talked about his tsunami experience and his recovery effort to the visitors… A precious, must-to-hear story when you’d come to Rikuzentakata. We moved to a recently opened temporary hotel named “Rainbow Sarai.” A colorful raw of small cottages…. The owner of the hotel is a famous jazz cafe owner. The quality of the music played in the reception room was amazing, something which you may not even encounter in urban areas. 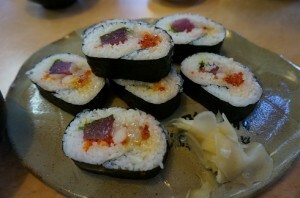 Then we moved to the room of Ms.Fumiko Osaka in a temporary housing raw to have a dinner together. 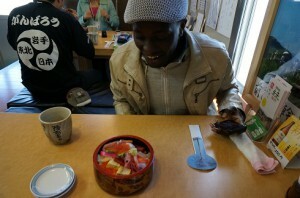 Anther friend of mine in Rikuzentakata also joined us. 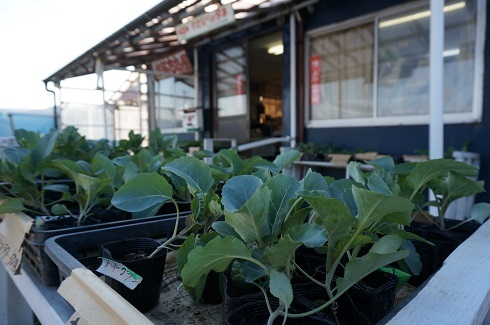 We enjoyed the season’s best – Wakame (sea weed)! 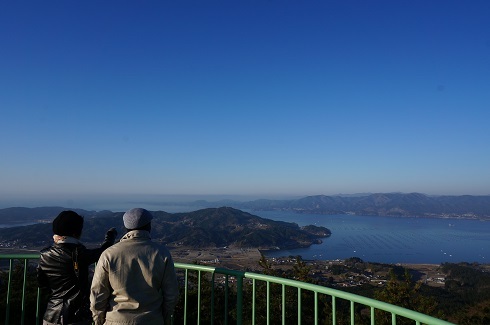 Coastal areas around Rikuzentakata produce very high quality seaweeds and other seafood, e.g., oyster, scallop, and various kinds of fish. 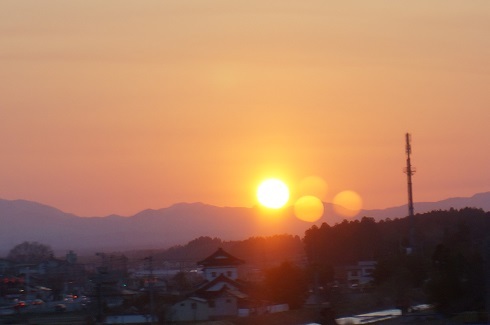 Next morning, we woke up early, a little past 5:00 am, and went to see the sunrise. It was just 15 min. 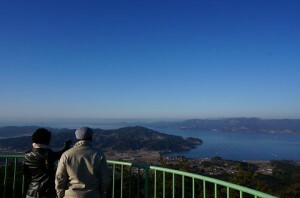 drive by a car to the watchtower located at Mt.Hakone, and we could have a grate view of the whole coastal area of Rikuzentakata and some part of Ofunato, the next town. Then we drove down to Hirota peninsula and walked around a small fishermen’s port. What a beautiful scene… You can feel that you are surely part of the nature. 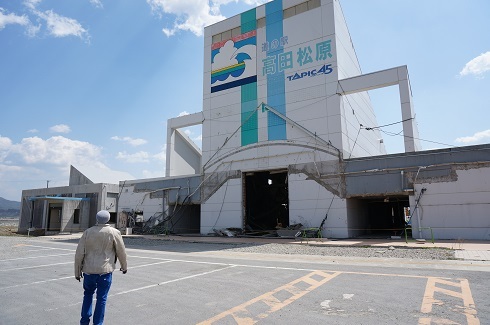 There were broken breakwater parts along the shore, showing how overwhelming the tsunami was. But in the very same place, natural pine trees were still standing. Natural things survived, and man-made structures were washed away. 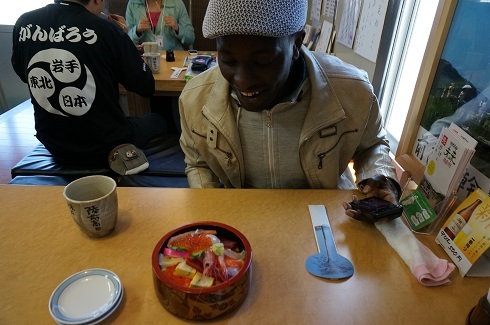 After the early morning sight-seeing tour, we visited the temporary housing of Ms.Fumiko Osaka again to have a breakfast together. 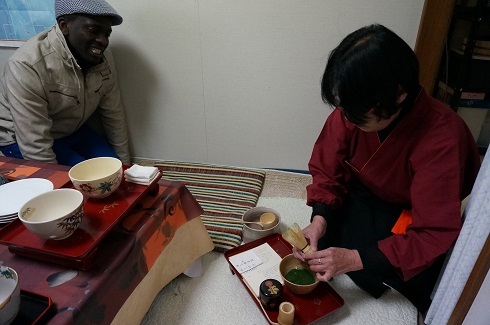 At the beginning, Ms.Osaka prepared Japanese green tea in a formal manner, and she used English while doing so! now you know that she is also a participant to Komo’s English club! You normally don’t imagine that you can experience Japanese tea ceremony in English in a tsunami-affected area like this. What a great way to kick off the day! 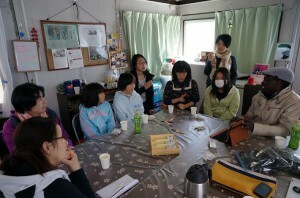 In the morning, we planned two slots of English communication sessions for the participants to Komo’s English club. 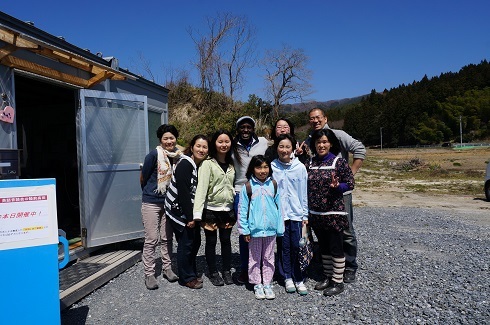 Taking the opportunity to have a visitor from outside Japan, in total 9 people came to see us! 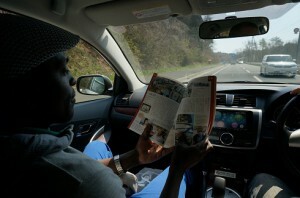 Zabron-san talked about Kenya and its capital city Nairobi on his iPad. People were very curious about what he explained. Some easy, quick English conversations. 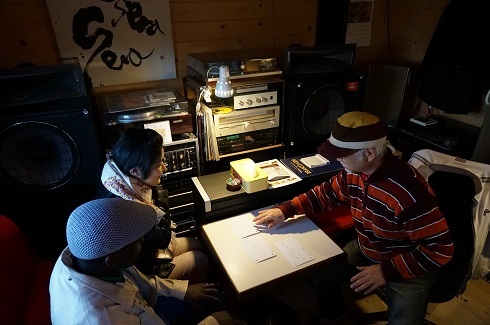 Across the generation, we all enjoyed the session with Zabron-san. Two hours passed by so quickly! It was a great interaction among the visitor and local people and was mutually beneficial. 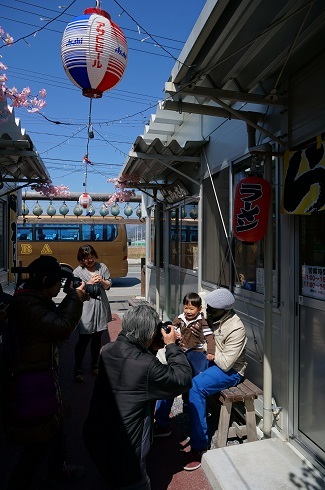 After the lunch, when Zabron-san was walking around the narrow street within the temporary mall, a group of tourists found him and surrounded him for a while. People wanted Zabron-san to take pictures with them. Then we visited a monument called “Love Letter for Tomorrow” in Akasaki area of Ofunato. The monument is still under construction, and many people come to help build this monument. This monument is built not just to record the disaster but to send a positive message to the future. The artist who has been working on this monument had once studied in Barcelona, Spain, where he was impressed with the works of Antoni Gaudí. You can somehow feel the nuance like that in this monument, can’t you? Listening to the story of Mr.Shida, who has been working with the artist and providing resources, including the site itself, to this project. 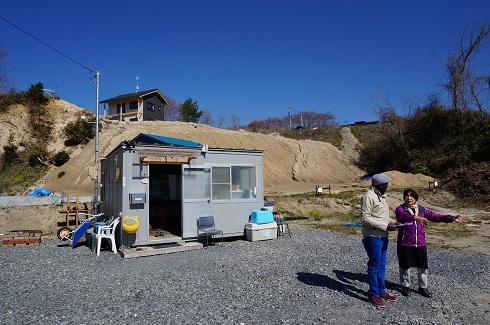 His house was damaged by the tsunami, but he said he would not want to leave only horrible memories to the future generation. 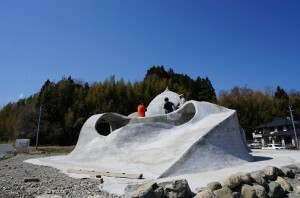 He wants to convey a challenge spirit of the recovery effort after the tsunami. This was the end of the planned program. Those two days were so deep and touching for all of us. 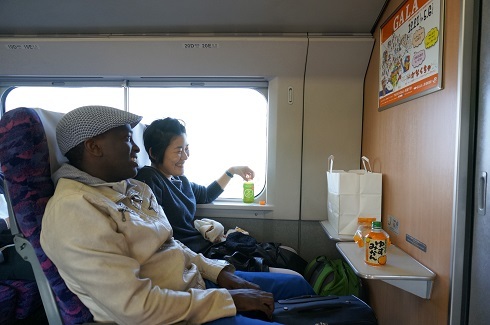 We headed back to Ichinoseki Station and took a Shinkansen bullet train a little past five in the evening. Zabron-san commented that these were incredible two days which he did not imagine before attending the tour.